This is the first of a two-part series covering fundamental concepts of accounting and valuation focusing on issues that lawyers often encounter. The first part, Accounting Fundamentals, will cover the three financial statements, balance sheet, income statement, and cash flows, and describe the components that are used to create them. In addition, it will cover how to derive meaningful conclusions from the data through ratio and trend analysis. 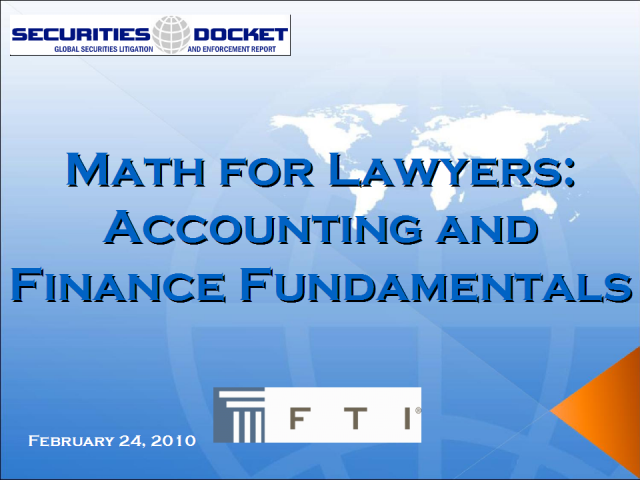 In addition to understanding financial statements, it will cover common Generally Accepted Accounting Principles and International Financial Reporting Standards. The presenters are Jeff Litvak, CPA/ABV/CFF, ASA and Ken Mathieu, CPA/ABV/CFF, both of FTI Forensic & Litigation Consulting.